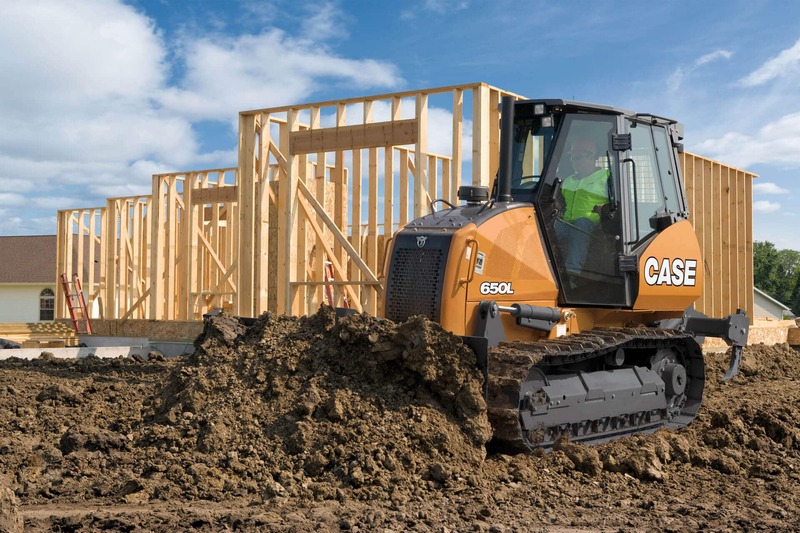 The CASE 650L crawler dozer is powerful, easy to operate, comfortable and long on uptime, just what you need to boost productivity and performance. The isolation-mounted operator’s station has been designed with more comfort and safety in mind for when you are on the jobsite from sunrise to sundown. With more push power, you will feel powerful and turbocharged as soon as you get behind the 650L controls. Get efficient performance from the 74 net horsepower, four-cylinder Tier III-certified engine. Each track gets individual power delivered through large drive components via the hydrostatic PowerStat drivetrain. And for optimum control and breakout force, the high-performance blade hydraulics feature large pump cylinders, while nearly any soil condition can be met with the adjustable blade pitch. Transporting the 650L or getting through low overhangs is easy with a low operating height. Seeing material flow under the blade is easy with a narrow, modular dashboard and tapered hood design. And for excellent operator comfort, the cab features an adjustable environment that’s quieter than ever. Rocks, dirt and debris are kept out of the undercarriage due to the sloping track frame. And daily maintenance is simple with the swing-out service panel and ground-line sight gauges.